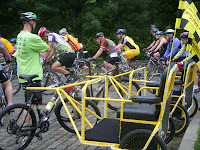 The past weekend, June 19 to 21, was filled with fund raising and biking extravaganzas. I'm riding in the Lance Armstrong - LiveSTRONG Challenge cancer ride, on August 23rd. It's a good organization that raises funds and awareness for a variety of cancer fighting causes - not just Tour Du France 7 Time Winners who have battled testicular cancer, multiple girlfriends and wives and various doping alegations... My friends, Cheryl & Mingo, have party/group they call, Fish on Friday, where they host a cocktail hour party at local bar venues to raise money for various charities. 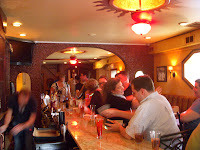 It's a reason to hang out at a bar, have a great time, and donate money for a worthwhile cause. Long story short, they agreed to host a fund raising party for my LiveSTRONG ride at a bar in South Philly called, Pat Bombino's. We basically had the bar to ourselves and invited guests. Cheryl and Mingo are the most fun-time people I know; full of energy, fun and spirit. We had a decent turn-out and raised over $250 among our 20 or 25 friends that came out on Friday night, primarily by selling chances to win tickets for donated prizes. From the files of it doesn't hurt to ask, I was able to get 2 pounds of coffee from La Colombe; Hair Care products from Plume Salon; a 2-month membership to Fitness Works Gym at 7th & Reed; LiveSTRONG Yellow Braclets, Bike Jersey's & power bars from Sue S.'s brother and Team Margaritaville or Bust; City Food Tour Tickets; and as a grand prize - a Margaritaville Frozen Concoction Maker from my boss at Williams-Sonoma. While the combined prizes were worth more than we raised, the party was great fun and we raised good will and awareness. 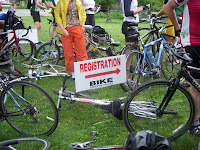 Sunday - June 21st was the Bicycle Coalition of Greater Philadelphia's Annual Freedom Valley Ride. The weather - well as anyone in the Northeast Region knows, was over-cast, rainy and fairly miserable. The start of the ride, for about the first 25 miles was in a constant and annoying misty rain. Not ideal riding conditions for narrow roads that have big climbs and steep descents. Wet roads and spray on your tires is a lethal combination for biking. We, Sue S. and her friend Susan B. (surprise - another biking gal named Sue!) 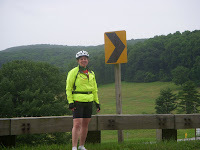 made the best of the day - with the ride improving once we got to Valley Forge Park. The ride home was infinitely better - along the Valley Forge and Conshohocken trails - nice and flat, allowing me to keep up a pace of between 16 miles to 18 miles an hour. 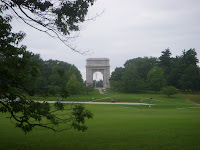 Scenic Over-look of the Valley in Valley Forge Park. Such verdant and bright greens - and not just from my bicycle gear! Two Sue's and a D9! 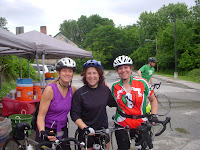 Susan B, Sue S. & me, fit biker chicks on the road. I betchya I'll be as good you!